DATE/TIME:	November 1, 2018	8:53 a.m.
On October 30, 2018, deputies from the Big Bear Sheriff’s Station conducted a traffic stop in the 40000 Block of Ironwood Drive in Big Bear Lake on a vehicle displaying expired registration tabs. The driver of the vehicle, identified as Stephen Lemelle, was found to have an active warrant issued for his arrest. While conducting a search of the vehicle, deputies located methamphetamine and related paraphernalia inside the car. Lemelle was detained without incident and transported to the Big Bear Jail for booking on misdemeanor charges of being in possession of a controlled substance and unlawfully possessing paraphernalia. 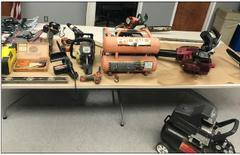 Detectives have identified rightful owners of some of the stolen items, and their property has been returned. The Big Bear Sheriff’s Station is seeking the public’s assistance to identify owners of the remaining items that were stolen. If you have been a recent victim of a reported burglary and believe any of these items belong to you, please contact Detective Andrew Montbriand at the Big Bear Sheriff’s Station – (909) 866-0100. If you have been a victim of a previously undiscovered or unreported burglary, please contact our non-emergency dispatch line at (909) 866-7581. Stephen Lemelle remains in custody in lieu of $50,000, with court procedures scheduled for November 2nd in San Bernardino County Superior Court.